Illinois Watch Company was one of the premier American watch manufactures. It's roots are in railroad-grade pocket watches but they are well known for their wrist watches too. In fact, Illinois produced a large variety of interesting wrist watches when Hamilton was only producing a small handful of models. 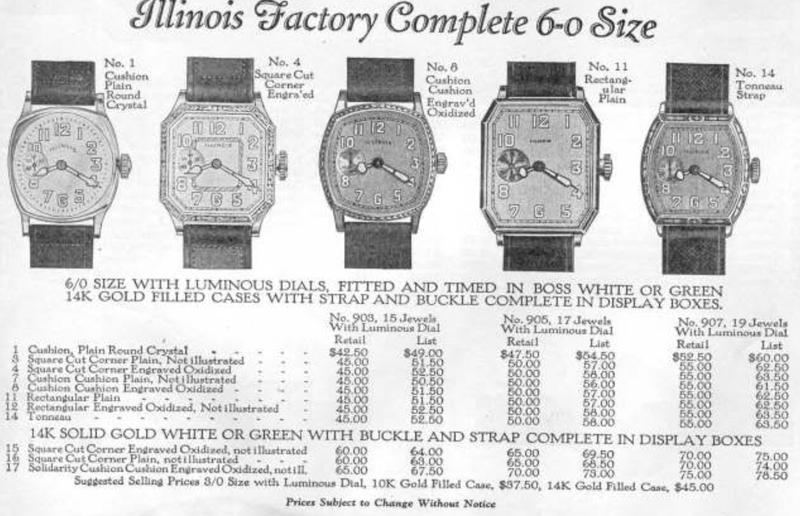 The Hamilton Watch Company purchased the Illinois Watch Company in 1928 and continued to make wrist watches for several years. Eventually the Great Depression put an end to that. 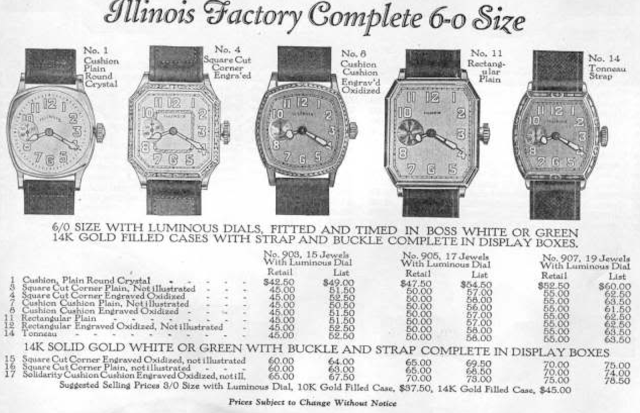 I don't know that much about the Illinois line but one of the interesting things about Illinois watches is the broad variety of dial and case patterns that were available within a specific model line. There are several models that are highly sought after and collectors are very dedicated. If you really want to learn more about Illinois watches then you need to purchase the new 5-volume book set that Fred Friedberg recently published. The book set is a marvelous resource for watch enthusiasts. It definitely qualifies as a Magnum Opus for Fred and he is generously donating the proceeds from the book to the National Association of Watch and Clock Collectors (NAWCC) and / or other charities. Feel free to let Fred know that Handy Dan sent you. I recently received an Illinois watch with a few other Hamilton models in need of some TLC. I thought I would do a post on it so you can see some of the details that make Illinois a sought after line for collectors. The watch in question is a Rectangular, also known as the Canby. It was introduced in 1923 and made for several years. It came in solid 14K gold and 14K gold filled, in both green and white gold. Like Hamilton models, the model came in either "plain" or engraved bezels. One of the attributes that made Hamilton the "premier watch brand" in America was the high quality of even the most basic movements. All Hamilton wrist watch movements came with a minimum of 17 jewels. Illinois, on the other hand, offered some models with 15 jeweled movements. Depending on where the jewels were, some wheels in the train were supported only by metal bushings. My project watch is in excellent aesthetic condition. The white gold filled case has a little wear to the corners of the engraved bezel. The dial and hands have been professionally refinished. The crown is an obvious replacement but other than that, the watch looks fantastic. It has the seconds at 9 pattern, which is always popular. The bezel and the case center are engraved. I don't know if these engravings were originally filled with black enamel but I think it would look great that way. This watch has the 15 jewel Illinois 903 movement. You could have also purchased this watch with a 17 jewel or 19 jewel grade. You can see that the 903 is not "jeweled at the center". Instead, the center wheel is supported by metal bushings. The center wheel doesn't move very quickly - in fact, it turns a complete revolution every hour. So metal bushings are a big deal but they are prone to eventually wearing out. Based on the serial number of the movement, this is a 1927 model. With the dial out of the way you can see that the dial-side of the main plate is uncomplicated. You can also see the lower 3rd wheel and the 4th wheel, also ride in metal bushings. That means two of the 15 jewels are cap jewels for the escape wheel. Ahh... nothing like a blurry photo... but I'll include it just to show you how the watch gets completely taken apart for cleaning. The first parts back on are the pallet fork and then the escape wheel and the 4th wheel. Next on is the rest of the train wheels, mainspring barrel and the barrel bridge. Uh oh... I thought the upper 3rd wheel jewel looked a little funny. When I looked very closely I realized it's cracked. In fact, the metal pivot inside wobbles around when you wiggle the center wheel. This jewel will need to be replaced but I don't have a donor movement. There's no harm in finishing the installation of the balance. Surprisingly this watch runs. The beat error is way too high at 9/0ms but I won't bother trying to reduce it at this point. Things are definitely a lot shinier now that the watch and case are cleaned. Too bad this watch will still require some work. After I wound the watch I found the cover of the mainspring barrel wouldn't stay on and it would pop off, releasing the mainspring tension. So that will need to be addressed too. It's too bad though, this watch sure looks like it's ready for more wrist time. I have to say that although Illinois made some fabulous models, I haven't caught the bug to want to collect them. This watch is over 90 years old and most Illinois models are that, or even older. 15 jewel movements will show more wear and tear than a 17 or 19 jewel grade. I suspect most Illinois watches have reached the end of their service life. To be fair, Hamiltons from the same period can be equally finicky but unlike metal bushings, rubies and saphires don't wear out so Hamilton movements can often be saved. Watches from this era should definitely be treated with great care and not exposed to the rigors of a more modern, shock jeweled watch, even a vintage shock jeweled watch.